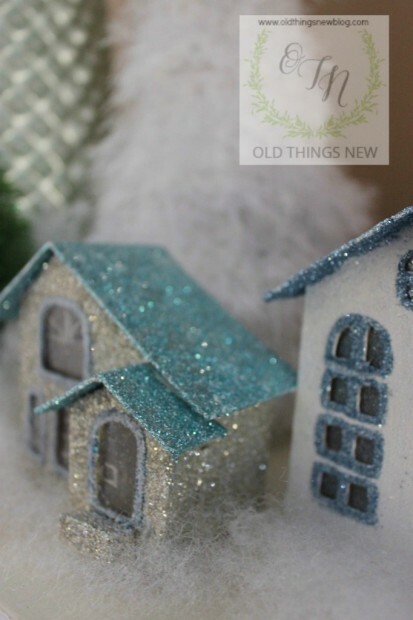 Did you know that these glittery little cardboard houses (putz houses) have been around for 130 years or so? Did you know that the word “putz” is a German word meaning “put” that in the German-American vernacular can mean “putter”, as in “How long are you going to keep “putzing” around with those houses?” And did you know that between 1880 and 1928 most putz houses were actually candy boxes? 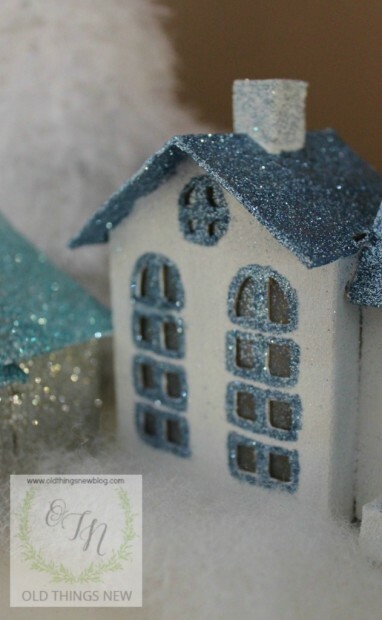 These facts and a lot of other fascinating history on putz houses can be found at Cardboard Christmas, a wonderful site filled with information about these houses and resources for buying or building your own. 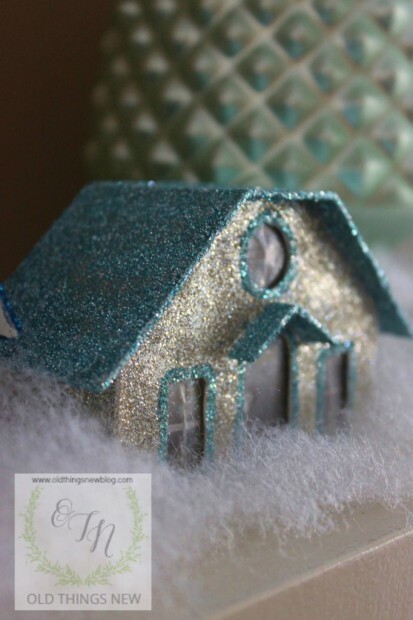 I first started loving these little glitter houses as a child when I saw them under my Aunt Gert’s Christmas tree. Do you have any “magical” Christmas memories? This was one of them for me. 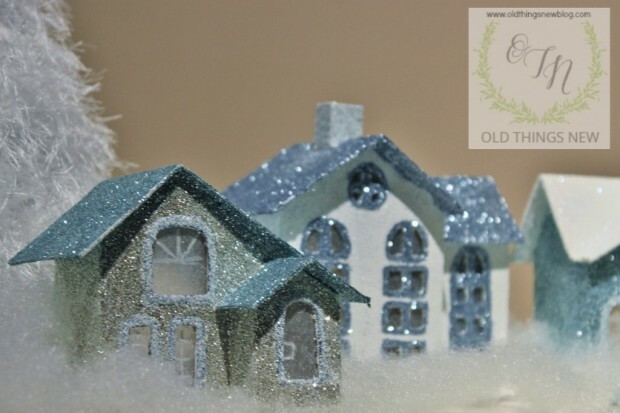 I’d forgotten all about them though until their recent resurgence in popularity when I decided that I would like to create a glitter village of my own. 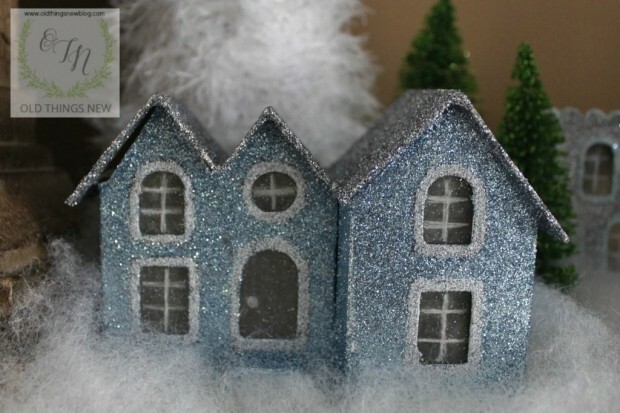 You can buy brand new glitter houses in many places (maybe you’ve seen those in the Pottery Barn catalog). 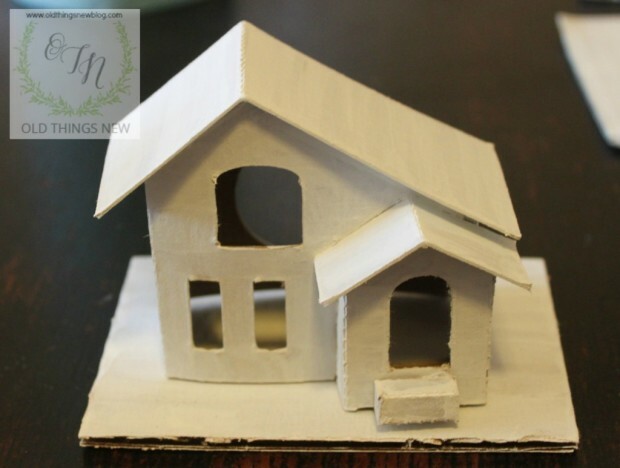 Vintage putz houses which are mostly Japanese made can be found online, as well as plans to build your own, or you can buy pre-assembled houses to decorate yourself. That’s what I decided to do. 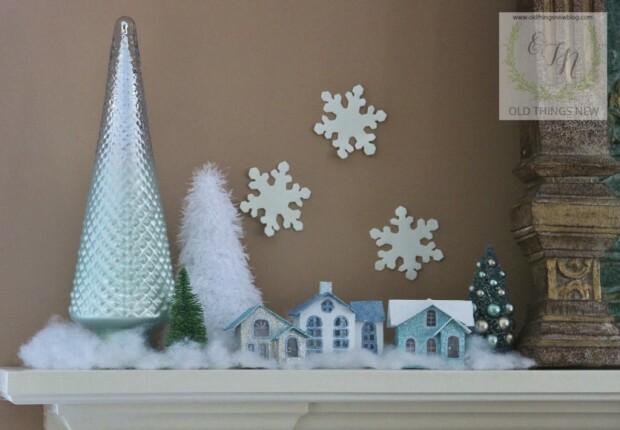 These are the houses I just finished for the mantle in my new home. I’m sad that you can’t see from my pictures how much they really glitter and sparkle, or their depth of color, but I just couldn’t capture them well with my camera. Some of the close-ups may give you a better idea of what they look like “in person” and I’ll share those with you later in the post, after this little tutorial. 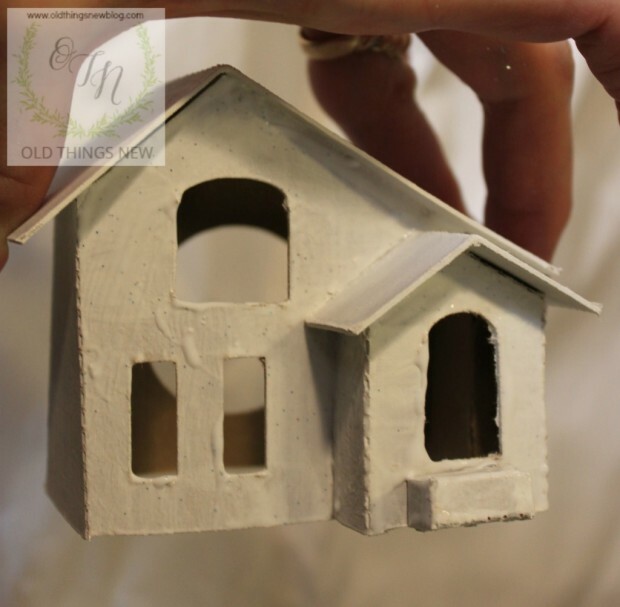 If you have no interest in making putz houses yourself then you can fast forward to see them right now. 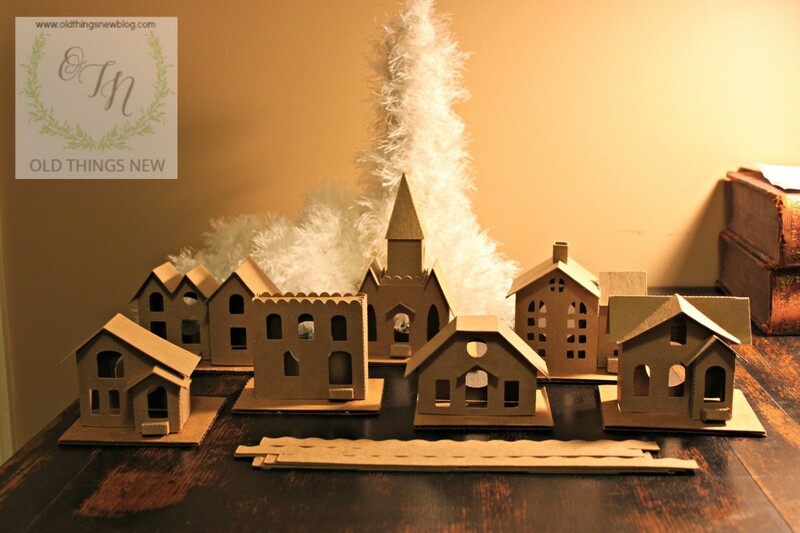 This was my village as it came in the mail, ordered off a site on Etsy called Little Village Houses. The full village was only $37.00. The first thing I did was to paint them with white craft paint. After the paint was dry I painted one surface at a time . . .
. . . with Martha Stewart glittering glue, which is similar in consistency to Mod Podge. 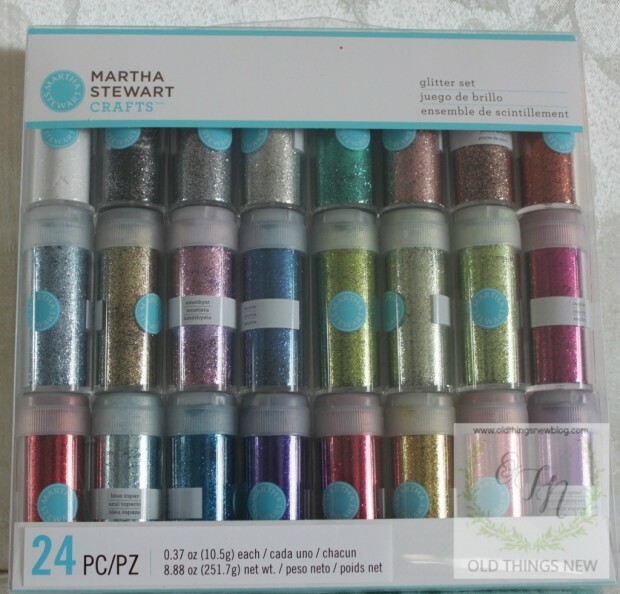 This is the Martha Stewart glitter set I got last Christmas. 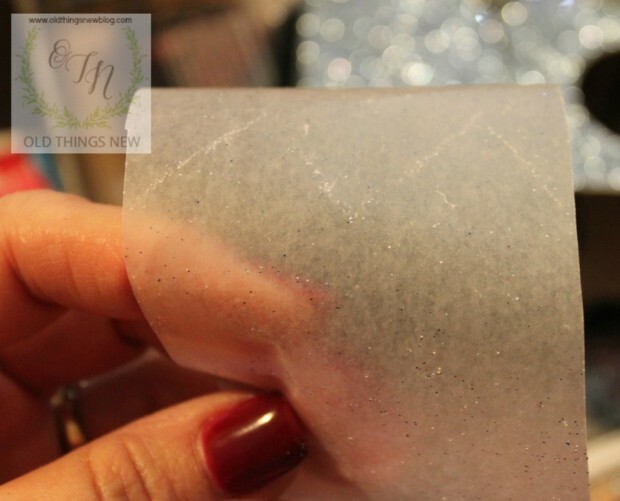 As I said in my Glittery Nutcracker post, there are less expensive glitters but Martha’s colors are the best! 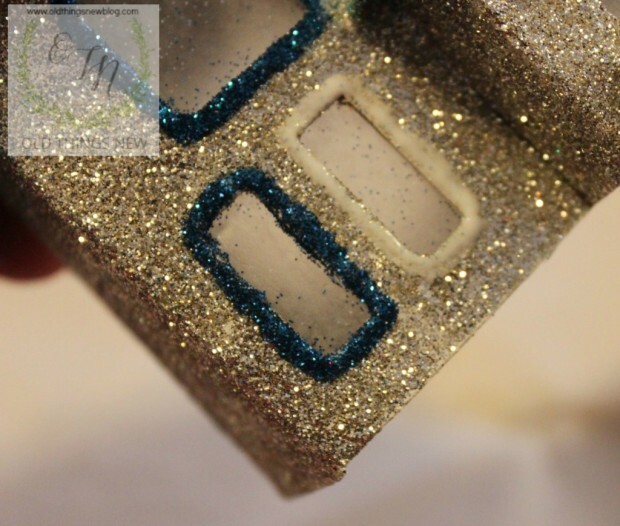 The glitter is applied by lightly shaking it over the glue. 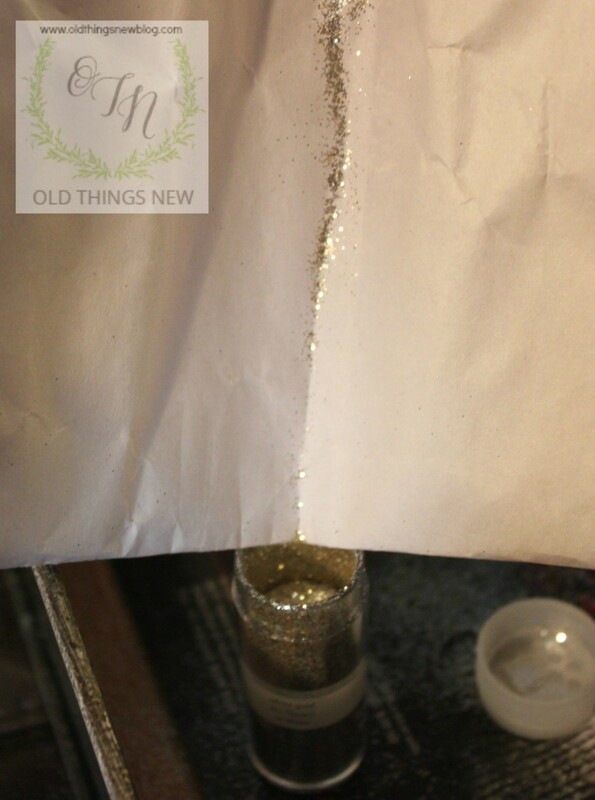 I gave the bottle little taps with my finger to control how much glitter is released. 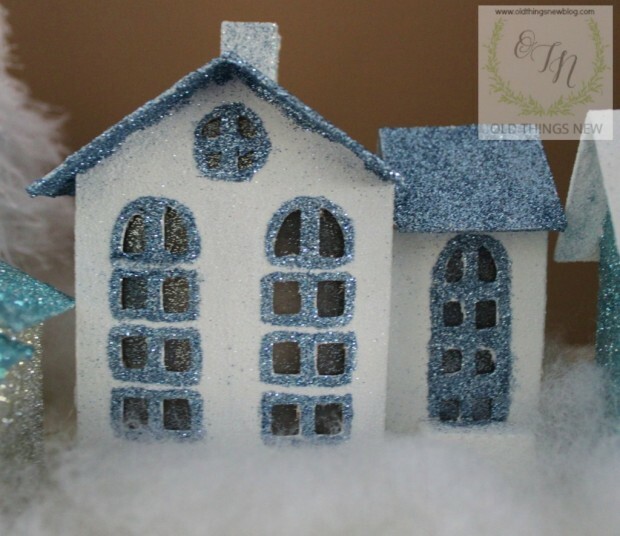 I did the main part of the house first and let it dry completely before glittering the roof. Here again you can see that I painted one section at a time with glue so the glitter could be applied while the glue was still very wet. 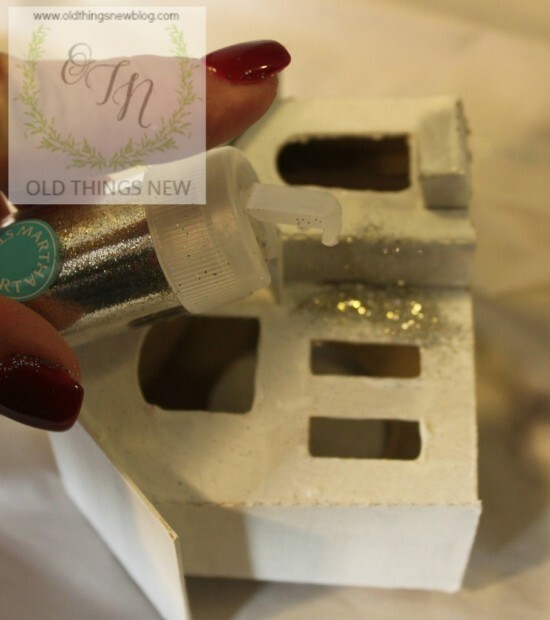 After giving the glittered house a few taps to allow the excess glitter to fall back onto the paper I worked over I scrinched the paper together to make a little crevice so I could poor the excess back into the bottle for another use. This glitter really goes a long way. 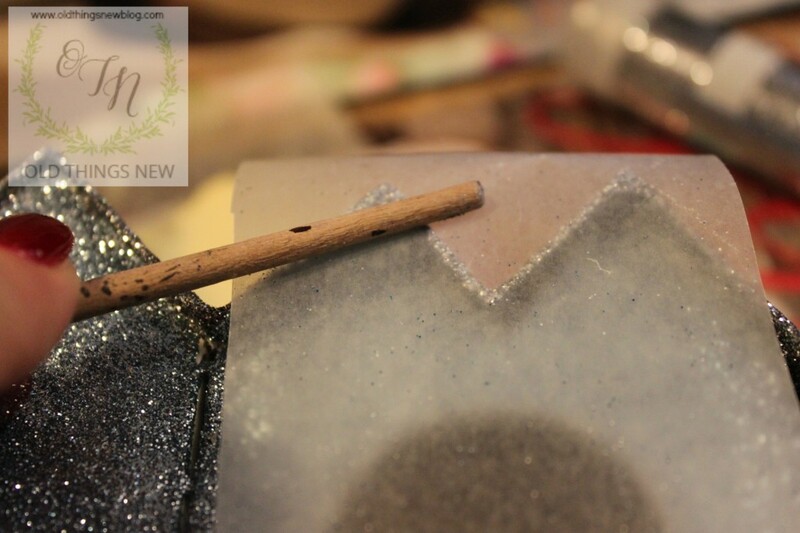 I think glittered acorns are next! I decided I wanted windows in my houses. 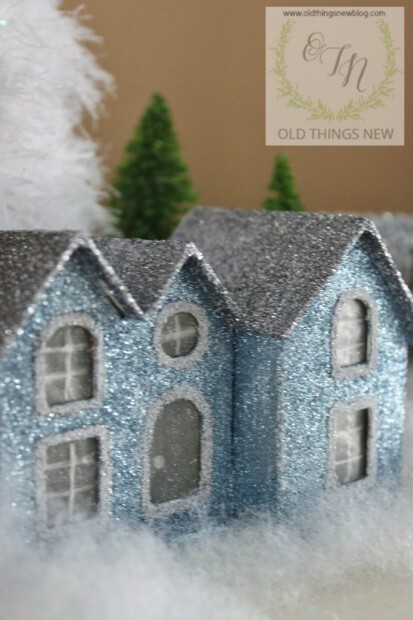 Many glitter houses have really fancy windows but in the interest of time I used what was on hand, good old wax paper. 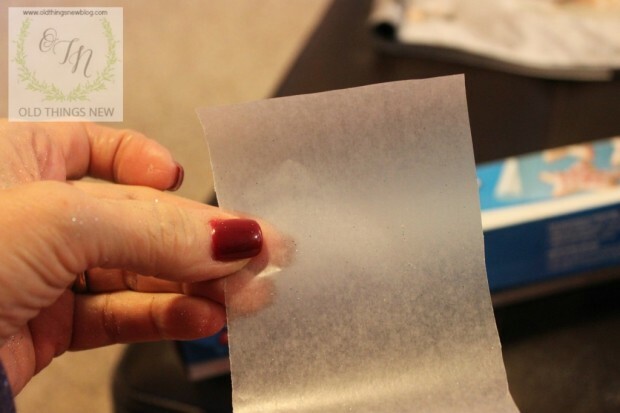 I cut a rectangular piece of wax paper for one section of the house at a time and for the houses that had peeks I placed the wax paper on top of the front of the house and lightly ran my paint brush handle over the peeks . . .
. . . which created a faint pattern . . .
. . . for me to cut my wax paper into the shape I needed. 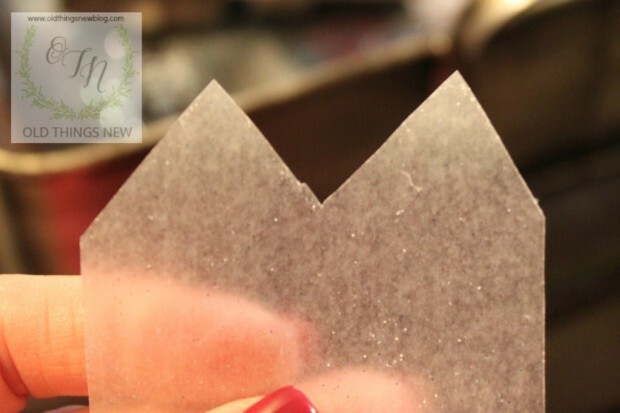 Next I applied glue with my paint brush to the inside of the house and carefully slide the wax paper in and pressed it in place. 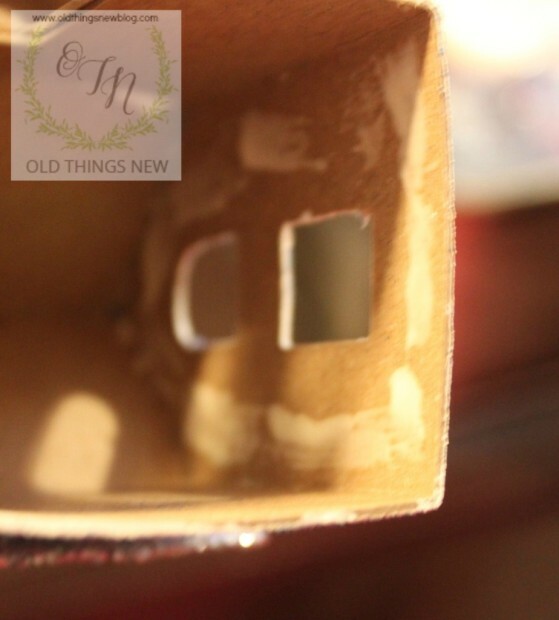 This is a step that I should have done before putting in the windows but you can learn from my mistakes! After all the houses had dried completely I decided to add some detailing around the windows and doors. 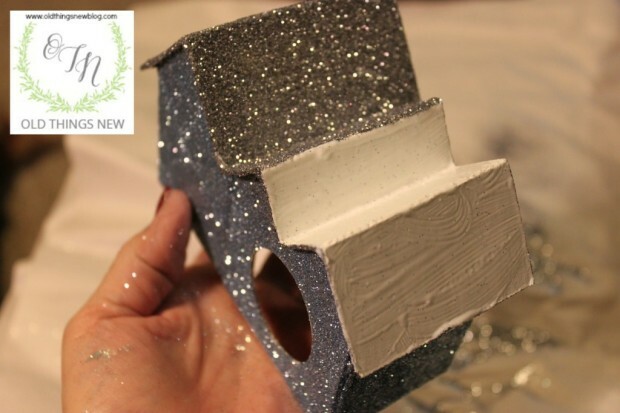 I painted glue around one window or door at a time and then shook on the glitter. 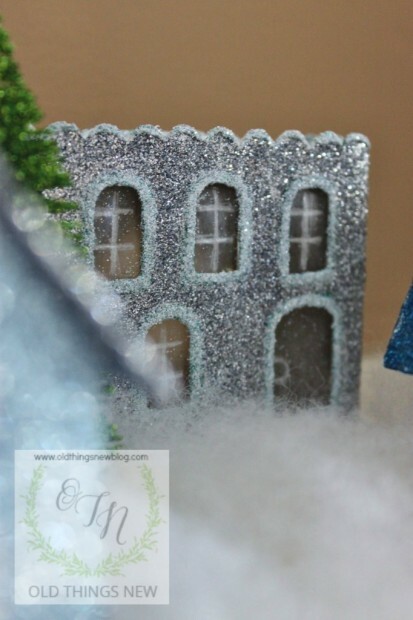 When I tapped off the excess some glitter still remained on the windows so I used a dry paintbrush to brush off any remaining glitter. Next . . . I decided I wanted my windows to have panes. 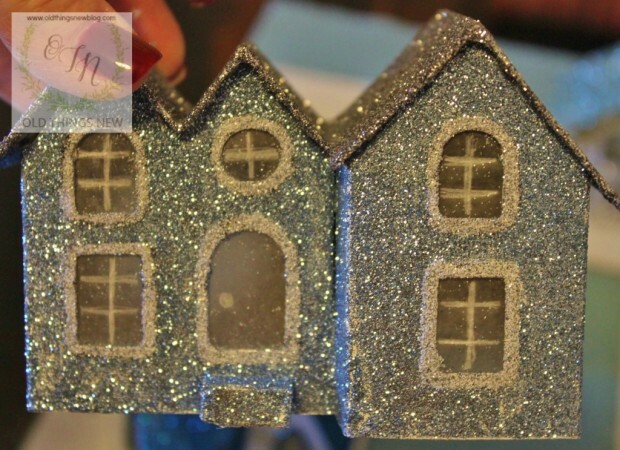 Some glitter houses have very fancy window panes made with more glue and glitter or with tiny pieces of wood or paper. 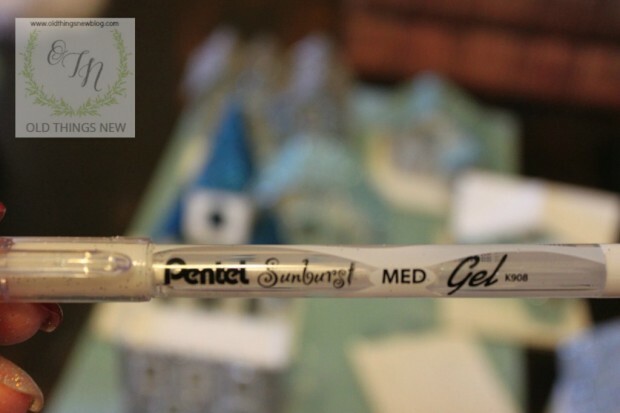 I chose the easy route and drew my panes with a white gel pen. I know, they aren’t perfect but that isn’t even noticed once the village is set up. 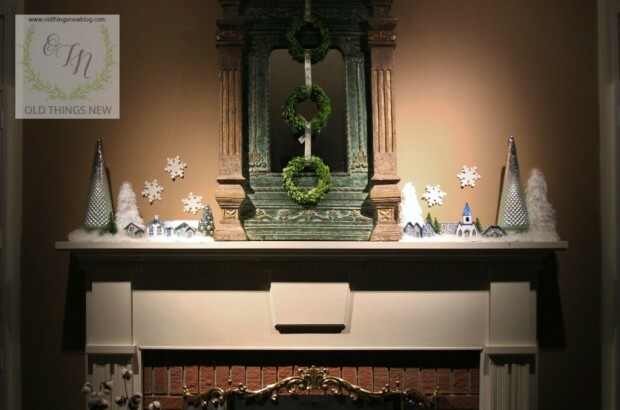 Following are several close-ups of individual houses that I placed along my mantle. 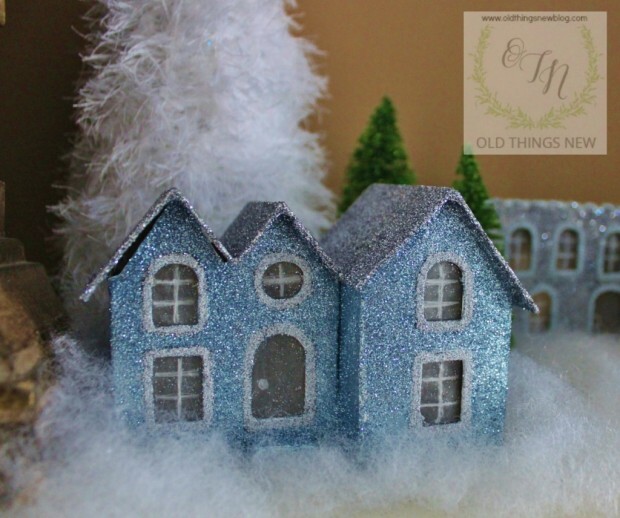 I used only white, silvers and blues as I wanted my village to look frozen, here in mild SC. 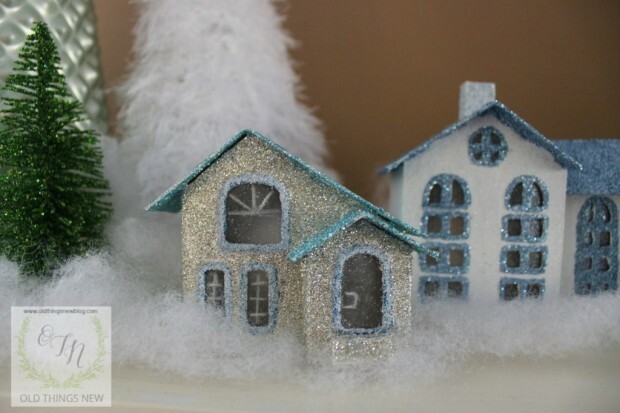 Each of these houses has a hole in the back where an electric light or battery operated votive can be inserted. I think that would really add to the ambiance. 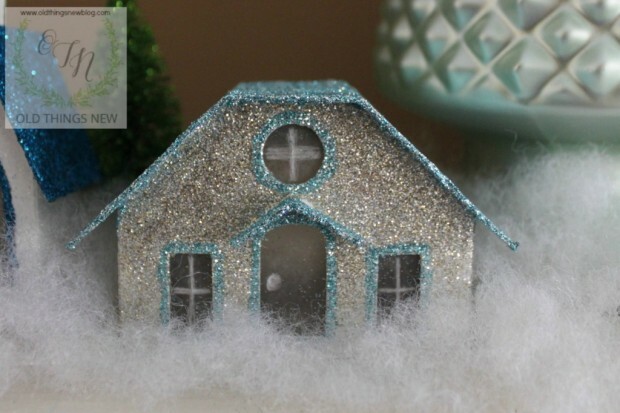 I’ve created a Glitter (putz) House board on Pinterest where I’ve pinned ideas for adding more detail to glitter houses and more tutorials for making your own, including patterns that can be downloaded. Though mine is simple for now I think that my village will most likely evolve over the years into something a bit more extravagant! Nighttime falls and the spotlight falls on my Putz Village. Again, I wish I could capture in pictures how much it really sparkles. It has been so much fun decorating for Christmas in preparation for my two daughters and my son-in-law who will be coming (from California and New York) to see our new home for the first time. Though it is so very different than our lake house and living in Washington State I’m praying that they’ll still feel like this is “home”. I’ll be back with one more post before Christmas, showing my Christmas decor, before taking some time off to enjoy my family. This post is so inspiring! 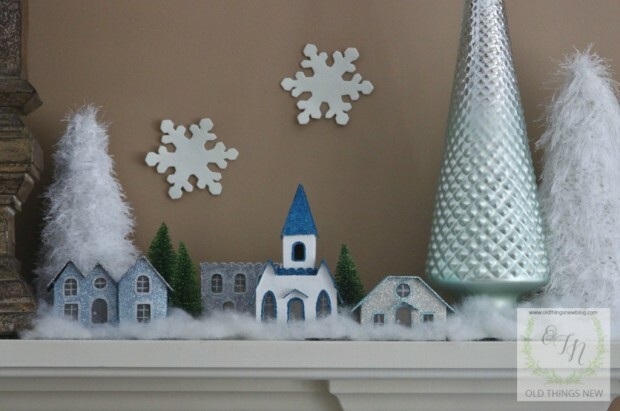 I’m off to Etsy to buy some houses – I have a house and church that were always on the mantle growing up, and would love to add to them! Merry Christmas! I love your little Putz houses. You make me want to give them a try! 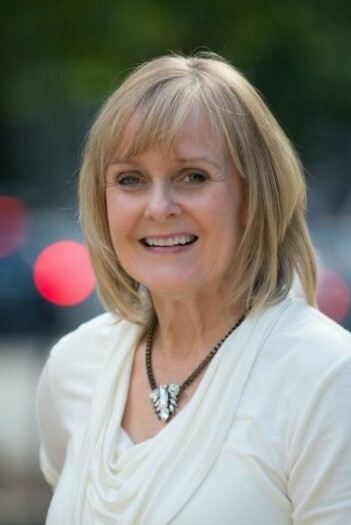 Your village is stunning Patti! Love the pretty colors you chose too. 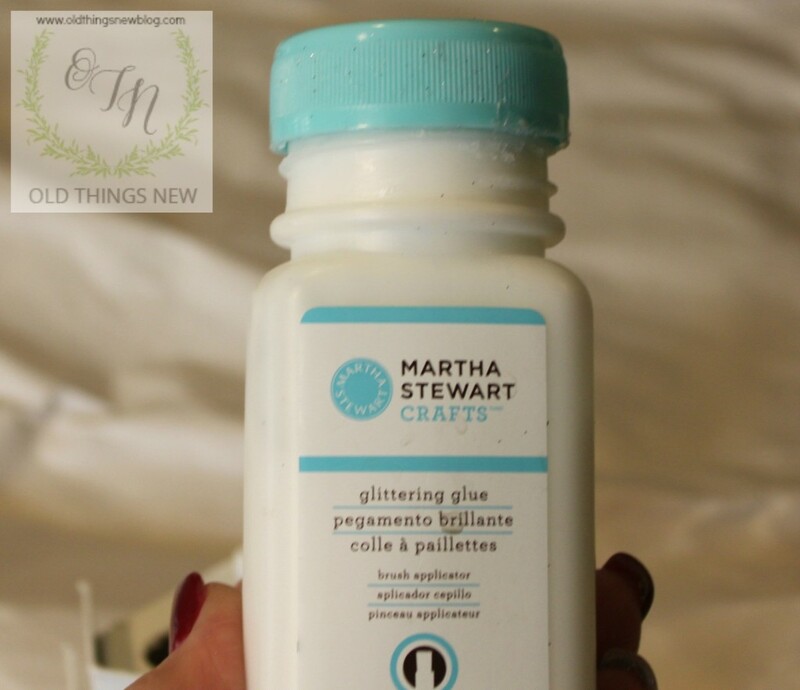 I’ve not tried the Martha Stewart glitter. I’ll have to see if we carry it at the store. Have a merry and blessed Christmas! Home is the people, Patti, not the place. I learnt that from when we moved three years ago from NY to Ohio. After leaving our home of 21 years, I was finding it very difficult in the beginning to separate the two. As long as I have my family around me, I’m “home”. : ) I’m sure you will feel the same once everyone is together. 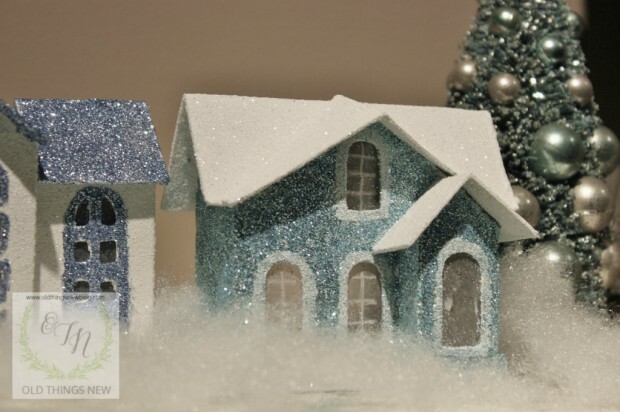 Your houses are so pretty! I did want to decorate some myself this year and put them on my mantel but did not get around to it. At this point I may buy some if I see them and save them for next year. Love the glitter kit you’ve got. Such a great selection. I think I should have put that on my Christmas list! These are just precious Patti! I would have gladly made some of these a few years ago. But, I started running across reproductions at Home Goods and T.J. Max so of course I started picking them up. Then I found a lot of them on clearance after Christmas the past two years. Now I have quite a collection. Yours look much more authentic. I love the little details! I put mine in my cabinet in the entry for a change this year and I am loving them. Happy to see that you will be sharing this with SYC. I adore your Putz Village, dear friend!!! 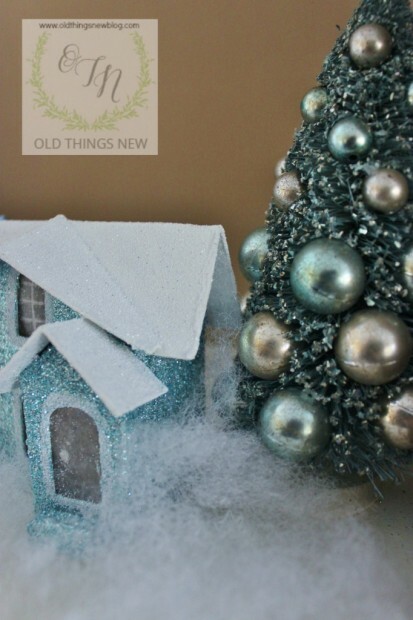 What fun, and yet challenging, to decorate a new home for Christmas!!! 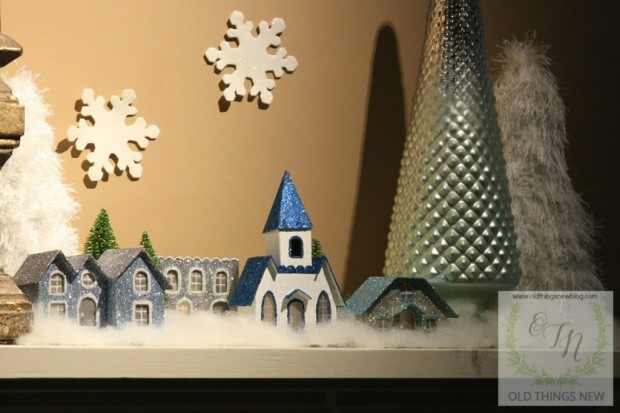 I love your little village and how magical it looks sitting on your mantle; you did a beautiful job. 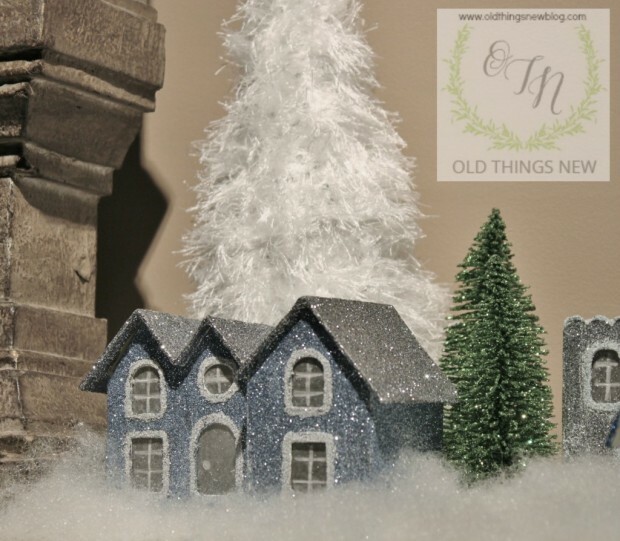 I also think the little white fluffy trees put the finishing touch on your setting. Did you by chance make these trees also? Talk about being enchanted, your village and the breath taking way you finished it is so pretty. 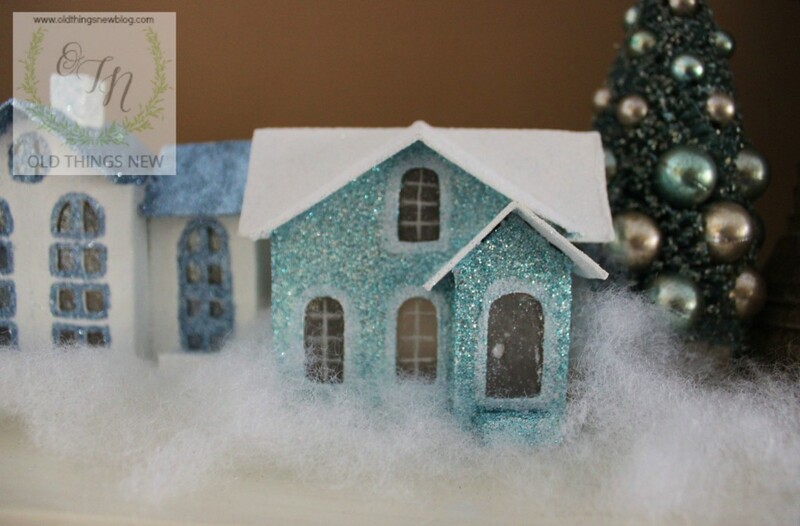 I love the glittered houses and how you did the windows. I must either make some of those or be able to buy some. I have to go to your Pinterest board also, you have captivated my interest so much. I love to have special projects to make things every year. 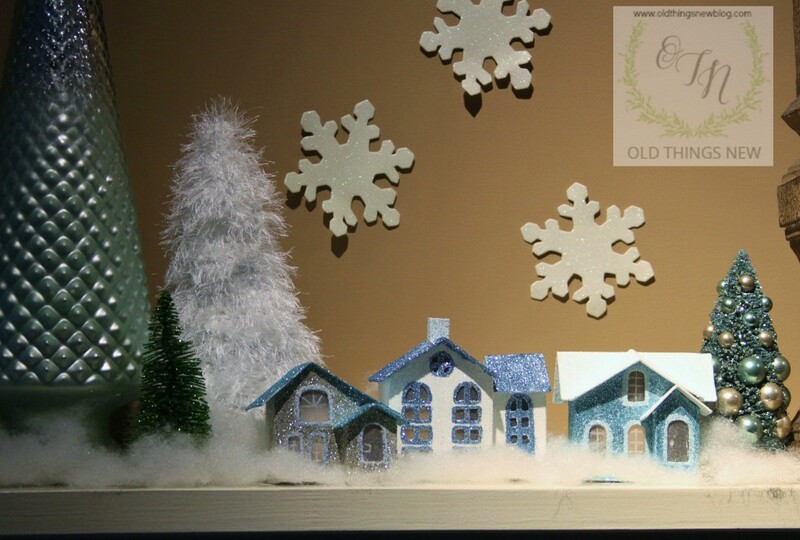 This year was different as we were busily making things for a craft show on 12/13. Not sure I want to do that next year so close to Christmas. Like to have time to make things without a mad scramble. At this point in life (74) I like to be able to take my time. Rushing isn’t my strong suit. If you choose to reply please do so to email address on this comment, thanks.